FIAT: Here’s HOW It All ENDS! Today’s letter is incredibly important, as it deals with how, despite the $21T in Federal debt, the immense wealth gap between rich and poor, the visible political divide, and the long-term mismanagement of the fiat monetary system, we still haven’t seen it crack wide-open. Imagine that you live in a town, where there are only three gas stations, one of which used to be great. It provided a great service at a fair price. It was quick, you were met with a smile, and the workers were happy. This was the only gas station in town back in the day, but it was well-run. Then, a second gas station appeared on the scene – this one had issues and internal troubles, but still, it caused the first one to panic and make mistakes of its own. They both were mediocre from here on. Then, a third owner, sensing the room for further consumer demand, also popped-up. All three owners realized they could all make a fortune by creating an arrangement amongst themselves to keep prices high, wages low, and to stop others from opening any additional gas stations, so they forced the mayor to keep things as is, or they would all shut down, causing a problem for him. The mayor agreed to their demands, and so, three owners cornered the market. This story represents the real chain of events of the U.S., Europe, and Japan, who became the superpowers of the post WW2 era. The U.S. was first to recover from the war, and then rehabilitated Europe, and lastly Japan. What they cornered, though, was more than a local gas station – they monopolized currency, with the U.S. becoming the king, and Europe and Japan the queens. Going back to our story, the residents of the town became annoyed with their corrupt mayor, but no matter whom they elected, the 3 owners of the gas stations all threatened him with oil shock, so he left them alone. Some became so disgusted that they decided to sell their cars and take public transportation, only to realize that it was worse. If we bring the story to real life again, as the U.S., Europe, and Japan started printing currency, driving interest rates to negative territories, and building an insurmountable debt wall, some bought precious metals, but soon realized they couldn’t use it to pay for everyday items. Something more was needed for the system to change, yet people were reluctant to take their battle to the streets, protest in front of the gas stations, or leave town – they became docile and simply believed this was how it was going to be from now on. In fact, the owners of the gas stations, after one major protest, colluded, coming up with a plan using the classic “good cop, bad cop” role play. The owner of the original station (the U.S.) would begin to lower prices a bit, so people would like it more, but they sold lower quality fuel going forward, without letting customers know (the USD has diminishing purchasing power in the form of invisible inflation to most people), but some detected the scheme, yet had no other choice, but to keep frequenting the station, as the other two held prices high (negative interest rates in Europe and Japan). Just like the three owners of the gas station, who kept the charade going for a very long time before the people finally become so enraged, as to either burn the stations down, fire the mayor, or leave town, so have Americans, Europeans, and Japanese accepted inflation, lower wages, corrupt politicians, and fewer opportunities, mostly without putting up a fight. There are people, here and there, who are opting out of the system, preparing for the day after, but they are in the clear minority. Most people don’t even see the problem until it’s too late. The U.S. is now raising interest rates, so the USD looks very appealing, compared with the EUR or JPY, at this point. That’s how central bankers are able to collude and keep the show running, with all the known faults in place – one currency is always looking more attractive, providing the “safe haven” trade to transpire.. But, the game ends with a knockout to the bankers, and it won’t take much longer. In the story, the other two owners become frustrated with the success of the first owner and his attractive prices, so they too lowered the quality of their fuel and cut prices. All three begin selling a bad product at a cheap price, but the people realized that their cars were having issues, due to the junk they have been buying. Moving this analogy to our present day, inflation and debt are catching up to governments and central banks, so hundreds of millions are realizing their pensions are at risk, their jobs are not stable, their savings could be jeopardized, and their assets might plummet in price, so a mass panic could ensue. This is how the three gas stations lost the loyalty of their consumer, as he felt completely cheated. In the same way, the ECB and the BOJ cannot allow the FED to keep pushing rates higher, making the USD attractive, the American business landscape stable, and the stock market boom, while their own economies get weaker and their stock markets flatten, so they also will begin to raise rates and discontinue QE. This is how fiat ends because a global tightening is the most dangerous currency maneuver the world has ever known. It will suffocate businesses and won’t allow refinancing of debt, to a major extent, so that defaults will become a daily event. As with the story of the town with the problematic monopoly of gas station owners, the residents would prefer the owners be fair and honest rather than force the change by themselves. They wait forever, suffering from inferior service, quality, and price before finally losing faith. While you and I have already figured out the game is rigged, 99% of the people haven’t and many never will. Fiat currencies always falter, but timing the end is extremely challenging, even next to impossible. That’s why, if I were a resident of this town, my objective would be to make it so that I’m prepared for the likely event of oil shocks, were the stations suddenly shut down, but in the meantime, focus on creating a situation where my life is valuable, balanced, and wealthy, regardless. In other words, scarifying our whole being, mentally, physically, and spiritually, in the pursuit of system change, abolishment of the Federal Reserve system and fractional banking, which is entirely out of our hands, is not what Wealth Research Group stands for. We are prepared for the currency crisis, by suggesting everyone owns sufficient amounts of physical precious metals, duffle bag cash, cold storage crypto, a second passport, offshore real estate, and a plan B, but in the meantime, we focus on building wealth as well, since time is precious, and our lives are worth living now, today, while we help to aread the word and prepare others. My good friend, Marin Katusa, for example, was a high school teacher, making a modest salary, when he seized an opportunity in the natural resources sector, which made him a millionaire. I love his personal story because it exemplifies the power of making a decision and becoming a world-class expert, no matter what. 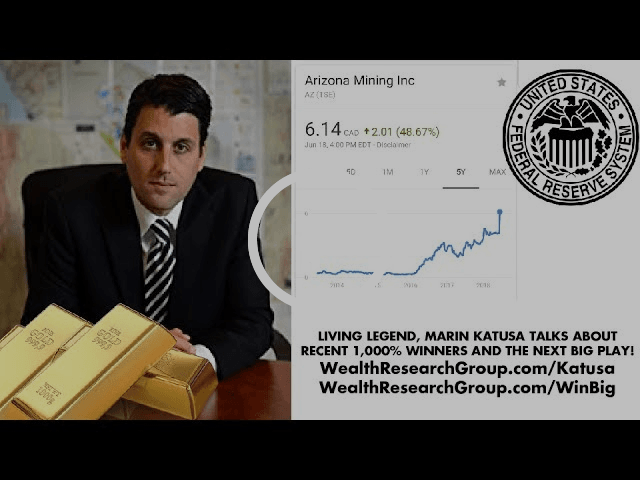 I recently caught up with him to see what’s on his mind, apart from the fact that he keeps finding stocks that go up 500%-1,000% on a consistent basis. Make it happen – build a life worth living, and prepare for the consequences of the fiat system you object to, at the same time. When the ECB starts tightening, it’s game over.